Types of Art: The first Jukun statue entered the British Museum at the beginning of the (20th) century, but it was ascribed to the Asante. 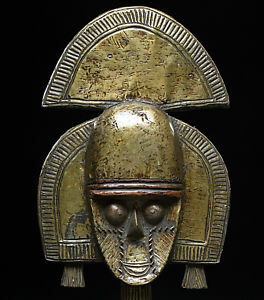 These figures, dressed and bejeweled, generally come in pairs; each eye has a small conical plug of metal; the ears are perforated and decorated with cylindrical elements; the face, with scarifications, is very specific in form, projecting forward and redoubling the plane of the neck. It has often been interpreted as a mask added over a hidden face. A conically shaped hat or an arrow-shaped crest covers the skull. The abdomen is conical, a bulge shapes the shoulders, the breasts are pendulous, the arms long, the hips round, and the hands are wide, marked with deep furrows to depict fingers, while the feet and legs are masses that are less differentiated. Religion: The semi-divine king, aka uku, is also the great priest. Responsible at one and the same time for the rain, the fertility of the soil, and the security and well-being of the population- and serving as intermediary between the royal ancestors and the living.